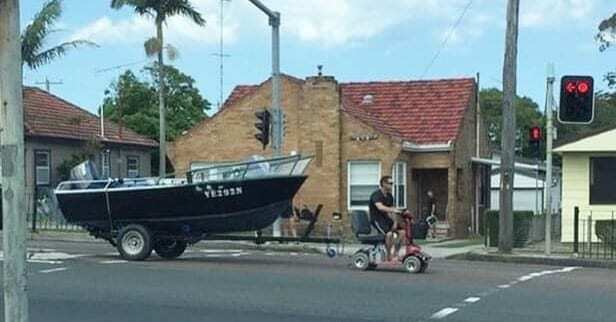 Police have charged a man who allegedly towed a boat on a trailer behind a mobility scooter. The 35-year old was caught allegedly towing the boat down the Pacific Highway in Belmont near Newcastle on 19 October, apparently smoking a cigarette as he went, before being stopped by police. The incident was captured by stunned onlookers who posted images on social media. The man was charged on Wednesday with multiple offences and is due to appear in court on 9 January. According to the ABC, the man faces charges of driving whilst disqualified, using an unregistered vehicle on the road, using an uninsured vehicle on the road, and using an unregistered trailer on the road. At the time, media reported that the man had said he wanted to go fishing.